Over the last decade or so, public and professional awareness have played a major part in the increased diagnoses of obstructive sleep apnea (OSA). This condition, characterized by the repeated cessation of breathing during sleep, can occur hundreds of times a night, and can last for a minute or longer. This results in a decrease in blood oxygen, and, in turn, can be attributed to unexplained headaches and tiredness. Studies show untreated sleep apnea can lead to high blood pressure, cardiovascular disease, diabetes and increased risk for stroke. While medical doctors commonly prescribe a continuous positive airway pressure (CPAP) device to deliver a constant supply of oxygen to the patient, one’s family dentist may actually be the unlikely hero in this alarming situation. The complex systems of bone, muscle, nerves and soft tissue that form the joint of the jaw (Temporomandibular joint), the pair of which are located just in front of each ear, are, by far, the most frequently used joints in the body. Involved in over 2,000 swallowing actions per day, they are prone to misalignment which commonly leads to headaches as well as ear, face or neck pain. The trigeminal nerve, often referred to as “the dentist’s nerve,” because it is responsible for sensation to the face and for motor functions like biting, chewing and swallowing, innervates approximately 40 percent of the head and face, and is connected to the onset of headaches and other head and neck painful conditions when disrupted. Often these symptoms are misdiagnosed as migraine or tension headaches when the real culprit, TMJ Dysfunction (TMD), can be the cause. The recognition that sleep apnea aggravates or triggers temporomandibular disorders (TMD) is gaining gaining momentum as more patients look towards dental solutions for relief from their sleep apnea symptoms. Many patients with sleep apnea disorder suffer from severe teeth grinding (bruxism). Sleep apnea is typically associated with loud snoring, and even a “gasp” sound as the individual wakes up and resumes breathing after an apneic episode. Teeth grinding and jaw clenching often occur during this semi-awake, agitated state as the struggle to breathe ensues. Dr. Phillip Durden of Winterville Dental, PC in Winterville, Ga. is a Master of the Academy of General Dentistry and is a Fellow of the American Academy of Craniofacial Pain. 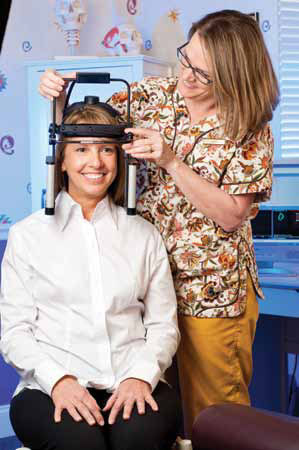 He understands the relationship between TMD, sleep apnea and unexplained headaches and employs a number of technologies in his practice that assist him with TMD diagnoses. With the 2005 opening of his TMJ Therapy and Sleep Disorder Center, Dr. Durden can efficiently narrow down the cause of pain and begin appropriate treatment. Dr. Durden comments that many of his patients are unaware that oral appliances are available as an alternative to the CPAP machine. Although the benefits of the CPAP therapy are unarguable, the method is somewhat difficult with which to become accustomed. The machine consists of a facemask, worn at night, that connects a hose to a ventilator through which a continuous level of oxygen is pumped. Despite the success in treating sleep apnea with this device, many individuals find that it causes a certain level of discomfort, aggravation and inconvenience. Consequently, some patients find that they are unwilling to continue its usage. As a welcome alternative, Dr. Durden offers a variety of oral appliances that aim at opening the airway by repositioning the lower jaw. This non-invasive treatment stabilizes the lower jaw, tongue, soft palate and throat muscles, effectively keeping the airway open and unobstructed. These appliances, similar to orthodontic retainers, are usually made from clear acrylics and can have adjustment features. For the approximately 18 million Americans who suffer from sleep apnea and/or TM Disorders, dentists like Dr. Durden can provide welcome relief. The utilization of a wide range of diagnostic methods by which to identify the cause of individual problems will continue to result in a reduction of misdiagnoses and an increase in pain relief. The partnership of dentistry and technology has resulted in an effective, “whole body” approach to healthcare. As the study of the connection between oral-facial structures, breathing and systemic conditions further reveals linked relationships, less invasive and early treatment options will continue to emerge. With experience that spans over two decades, Dr. Phillip Durden delivers comprehensive dental solutions in the quaint small town of Winterville, Georgia, just 7 minutes from downtown Athens. Combining dedication to continuing education, extensive clinical experience, and a long-standing personal commitment to improving his patients’ dental health, Dr. Durden and team work together to provide compassionate care to those suffering from acute and chronic oral-facial pain. Dr. Durden, along with his dedicated team at Winterville Dental, PC, practices comprehensive family dentistry for all ages as well as cosmetic procedures such as teeth whitening and porcelain veneers, placement of dental implants, root canal treatments and sedation dentistry. Dr. Durden has a special interest and practice focus in TMJ Therapy and oral management of Obstructive Sleep Apnea and CPAP Intolerance. Perhaps the service that patients comment most about is the technology Dr. Durden integrates into his practice. He believes continuous education and new methodologies are key to providing successful treatments. Dr. Durden and his team invest hundreds of hours annually learning about TMJ & Sleep Disorders, head, neck and facial pain, CEREC® CAD-CAM restorative technology and Invisalign® orthodontics. As an Athens native, Dr. Durden is a proud University of Georgia Bulldog. He played trumpet and marched in the renowned UGA Redcoat Band. After graduating in 1985 with a Bachelor of Science Degree in Microbiology, he continued his education at the Medical College of Georgia School of Dentistry. He received his Dentistry Degree with Honors in 1989 and opened his Winterville practice that same year. Since then, he continually builds his dental knowledge, including the completion of a five-year continuum in advanced dental topics, including placement of dental implants, dental surgical techniques and sedation dentistry. Providing dental care to those cannot afford it is a passion of Dr. Durden’s; in 2011 he helped low and no-income patients through the Georgia Mission of Mercy (GMOM) dental clinic. Through educational awareness, fundraising and free treatments GMOM improved the dental health to those who would otherwise go without. Dr. Durden and his team proudly participated in the clinic along with their Georgia Dental Association colleagues to offer service to those suffering from dental infections and pain. Dr. Durden has strong roots in Athens. He grew up in the surrounding area, and locals will remember his father’s Durden Music Store in downtown Athens. He and his team remain active in the local community, participating in Winterville’s annual Marigold Festival and proudly winning First Place in the 2011 Marigold Parade. Dr. Durden and his wife, Janine, have two children, Suzanne and Craig. Suzanne is also a UGA Bulldog, keeping active with her sorority’s philanthropy projects while studying Public Relations. Craig attends Young Harris College and when not in class, he is exploring the Georgia mountains and playing intramural soccer, basketball, and flag football. Winterville Dental has a new look!